Hello! 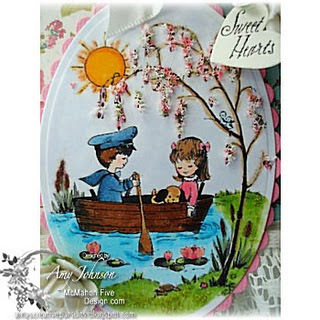 Today I have the CUTEST McMahon Vintage Digital to show you called 'Sailing With Love'. I squealed with delight when I first this image, I just thought it was so adorable. To make my card I used an old Midnight Madness sketch (MMSC89) and paper from Prima called 'Madeline'. I colored the image with Copics, then put Flower Soft in the trees and grass and Brown Flock on the Cattails. I embellished with more Primas, ribbon, and vintage trims. The heart was cut with a Cuttlebug, and the sentiment is by Crafty Secrets. Here is a close up so you can see the Flower Soft details better. Be sure to visit the McMahon Five Designs Blog to see all the rest of this week's new releases. And if you'd like to see more cards made with the new releases, just visit the rest of the McMahon Five Designs Design Team Members Blogs listed in my sidebar. Awww this is so so sweet. What a cute image. I love the way you created the tree. Makes it look real. Great job Amy. Oh My gosh, is all I can say. Love the flower soft, it adds such a fantastic touch and wonderful dimentions. Beautiful! Love how the branches are dripping with blossoms and your use of the Flower Soft to accomplish that. NICE! Beautiful job. Ditto what Marlene said. WOW Amy this is beautiful what a stunning image, beautifully coloured and that flower soft is just perfect it looks like blossom, the lace and papers all go to make this one superb card. 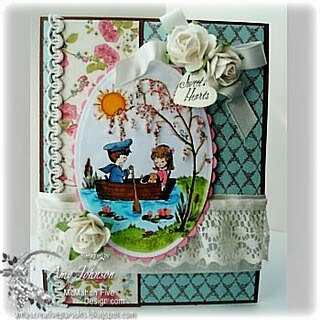 WOW- I love your coloring and the flower soft really adds alot- beautiful card!! !